All three of the North Cheshire Rail Users’ Group stations have scooped awards at the 12th Annual Awards Evening for Cheshire Best Kept Stations with Frodsham being named Cheshire’s Best Kept Station. The Awards were presented on Tuesday (13th January 2015) at The Grange Theatre, Hartford, Northwich by Retired Major Eddie Pickering, Secretary of the Cheshire Regiment Association, during a World War One Commemoration themed Evening. Over 200 guests attended the evening including Mrs Susan Sellers, the High Sheriff of Cheshire, the Lord Mayor of Chester and 5 local Mayors. 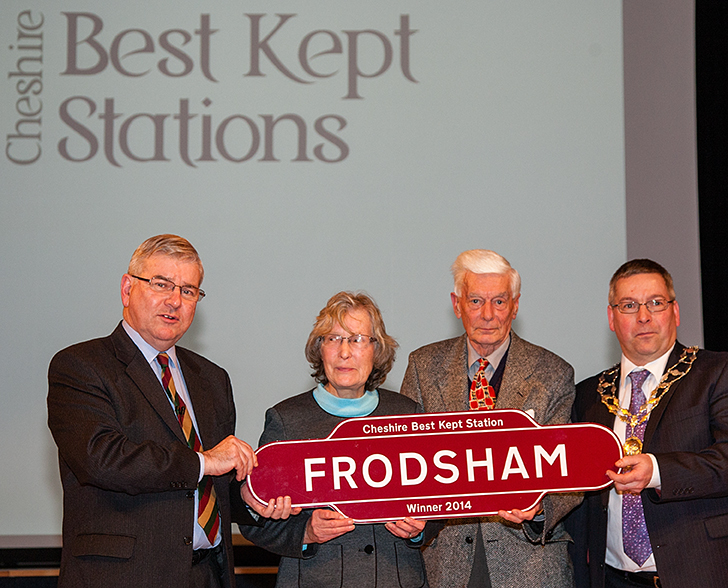 Frodsham Station won the top award and was named the Best in Cheshire because they were a cut above the other stations. Reminding the 200 guests that there was now a hairdresser in the station buildings who supported the volunteers, it was not surprising that the station was always in trim. John also paid tribute to the North Cheshire Rail Users’ Group (NCRUG), led by their Chairperson, Janet Briggs, who have been dedicated volunteers at the station for many years. Helsby Station won the “Cheshire West and Chester Award” recognising NCRUG’s consistent and regular work parties at this station. Helsby is no stranger to awards being the only station to have an award every year since the competition started in 2003. Runcorn East Station won the “Youth Challenge Award” acknowledging work carried out by the local schools and young people co-ordinated by Halton Borough Council and NCRUG lead volunteer John Hobbs. This work has created a sense of pride and unity for these youngsters both on their local housing estate and at the station. “We’re delighted that the three NCRUG stations have been recognised at the awards. “NCRUG were delighted when Frodsham Station was named as the overall winner at the Awards Evening. Over the last three years, the station has undergone major changes with the complete restoration of the Grade 2 listed building now partly occupied by Frazar James – Hair Design. In addition, the heritage railings have been renovated and painted; a considerable length of new fencing installed and customer information screens together with ticket machines now available on the platforms. A small group of volunteers has continued to work on all the gardens with the bed in front of the building now completely re-planted and edged with Victorian style rope edgings. “On behalf of FrodshamTown, I congratulate the North Cheshire Rail Users’ Group, especially Janet and Philip Briggs, on our lovely station being declared the Best in Cheshire 2014. Also thanks go to Simon and Jan Chang at Frazar James Hair Design who support and help the volunteers. Throughout the seasons, the station is always tidy and the gardens colourful and full of flowers. 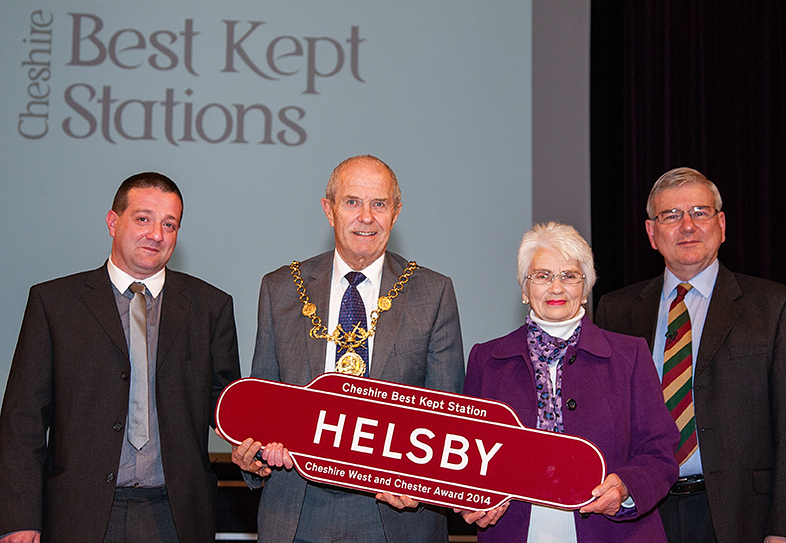 “These awards just keep on coming and coming for Helsby Station. It is a credit to the small team of 6 volunteers who keep the station looking so nice. Their work was further enhanced by the completion of the project to restore the station buildings on platform 1. 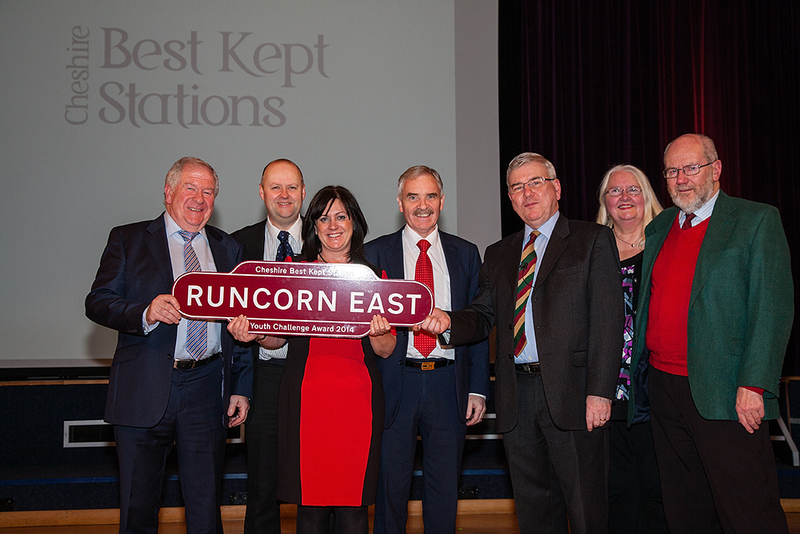 "We are thrilled to have won the “Youth Challenge Award" for Runcorn East Station. We have worked hard throughout the year to improve the environment at the station. Arriva Trains Wales, Halton Borough Council, the National Citizen Service (NCS) and all the local schools in Murdishaw have been critical to this achievement - however we are always seeking volunteers so that we can undertake more schemes and make the station even better. I would especially like to thank Kerry Fairchild and her team at Halton Borough Council for coordinating our projects and making them come to life. It is a fine example of volunteers working in partnership with colleagues at the town hall and other stakeholders and making a real difference to our local community”.